spicy fried pork sausages with sundried tomatoes and basil inside of them with MUSTARD. how do you go about frying up your sausage? Yeah, you need some spicy brown mustard to go with that. Try Gulden’s if you’re in the states. Not badly priced, can be found in most grocery stores, not too much on the spice, but a very robust mustardy flavor. I would eat that for sure. In fact I may try to recreate that. Canadians are so weird sometimes. This could just as easily be a meal in the Southern states. Except there everything would be fried and breaded. 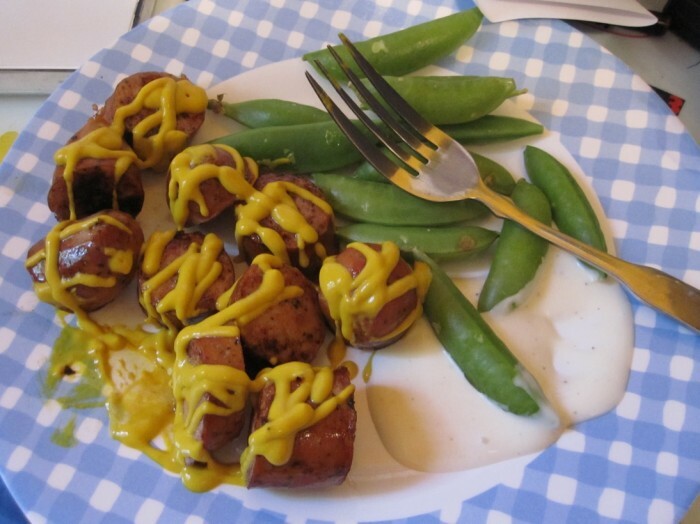 Your sausage has become a mustard delivery device.